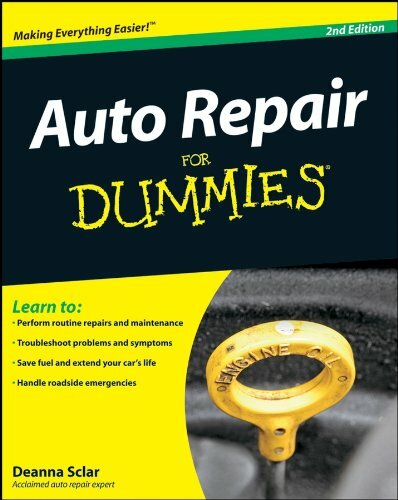 [PDF] Auto Repair For Dummies | Free eBooks Download - EBOOKEE! Description: The top-selling auto repair guide 400,000 copies sold now extensively reorganized and updated Forty-eight percent of U.S. households perform at least some automobile maintenance on their own, with women now accounting for one third of this $34 billion automotive do-it-yourself market. For new or would-be do-it-yourself mechanics, this illustrated how-to guide has long been a must and now it's even better. A complete reorganization now puts relevant repair and maintenance information directly after each automotive system overview, making it much easier to find hands-on fix-it instructions. Author Deanna Sclar has updated systems and repair information throughout, eliminating discussions of carburetors and adding coverage of hybrid and alternative fuel vehicles. She's also revised schedules for tune-ups and oil changes, included driving tips that can save on maintenance and repair costs, and added new advice on troubleshooting problems and determining when to call in a professional mechanic. For anyone who wants to save money on car repairs and maintenance, this book is the place to start. Deanna Sclar (Long Beach, CA), an acclaimed auto repair expert and consumer advocate, has contributed to the Los Angeles Times and has been interviewed on the Today show, NBC Nightly News, and other television programs. No comments for "[PDF] Auto Repair For Dummies".